The R-PLEX Human FGF (basic) includes a matched capture and detection antibody pair and calibrator for the quick and easy measurement of FGF (basic) in biological samples. R-PLEX products leverage MSD’s electrochemiluminescence technology for better sensitivity and a larger dynamic range than traditional ELISAs. R-PLEX matched antibody sets enable the development of singleplex and multiplex immunoassays. Individual assays may be developed using MSD avidin- or streptavidin-coated plates. Custom multiplex assays with any combination of R-PLEX analytes, as well as R-PLEX plus U-PLEX analytes can be developed on U-PLEX MULTI-SPOT plates. To learn more about the advantages of R-PLEX products click here. 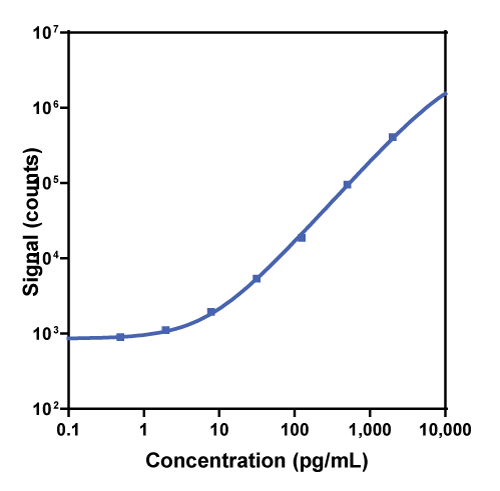 Calibration curve for the R-PLEX Human FGF (basic) was assessed and representative data is presented below. Description - Basic Fibroblast Growth Factor (FGF (basic), bFGF, FGFB, FGF-2, HBGF-2, FGF2) is a member of the FGF family of growth factors. It stimulates the growth and development of new blood vessels (angiogenesis) that contribute to the pathogenesis of several diseases (e.g. cancer, atherosclerosis). The mammalian FGFs mediate numerous developmental programs during embryogenesis and play critical roles in adult tissue repair and maintenance. bFGF has a heparin binding domain and oligimerizes upon binding to heparin making it less available to detection. Heparin plasma samples should not be tested for bFGF.